A recently completed study offers grapegrowers and winemakers a greater understanding of how fungal rots affect wine quality – in turn, guiding future decision-making around harvesting affected fruit. The research – carried out by Professor Christopher Steel from the National Wine and Grape Industry Centre (NWGIC) at Charles Sturt University – used a range of tools including Attenuated Total Reflectance Fourier Transform Infrared Spectroscopy, or ATR FTIR, to investigate measures of bunch rot contamination. Bunch rot of grapes causes significant economic losses to the grape and wine sector worldwide. It is caused by phytopathogenic filamentous fungi, with Botrytis cinerea the principal culprit close to harvest. Other fungal organisms include species of Aspergillus, Cladosporium, Penicillium and Rhizopus, but these fungi are often opportunistic pathogens, only pouncing and infecting plant tissues when the host is compromised – for example, through damaged skin. Professor Steel’s research, funded by Wine Australia, successfully used ATR FTIR in conjunction with chemometric modelling and machine learning algorithms to discriminate individual Chardonnay grape berries inoculated with the different types of fungi responsible for bunch rots, including Aspergillus spp., Botrytis cinerea and Penicillium expansum. The study found each of the fungi investigated produced a different suite of secondary compounds, some of which were implicated in deleterious effects on wine quality. The grapes were sorted into one of five levels of Botrytis cinerea (grey mould) severity and were made into wine, grape juice and finished wine. Measurement of the fungal sterol, ergosterol, allowed more accurate quantification of the fungal biomass present in the batches of grapes. Based on this technique the amount of fungal biomass was determined and ranged from 0.07 to 5.16 g dry weight of fungus per kg wet weight of grapes for the five levels of grey mould severity. The finished wines were also subjected to sensory discrimination testing to determine the infection rate required to produce a significant difference in comparison to the control. ‘Volatile organic compounds associated with fungal taints in wine diminished during the wine making process, but were still above the sensory perception thresholds in wine made from grapes with the higher levels of grey mould contamination’, Professor Steel said. He said the findings suggested that the threshold for Botrytis contamination in Chardonnay grapes was between 0.35 and 1.00 g dry weight of fungus per kg wet weight of grapes, equating to a range from 1–2 berries in the bunch to 10 per cent of the bunch affected with Botrytis. Interestingly, the differentiation of wines made from the different bunch rotting fungi was not as clear as for grape juice, suggesting that the compounds responsible for discriminating grape juices were lost during fermentation. Professor Steel said the findings were valuable to the wine sector. Professor Steel said while thresholds for bunch rot contamination require some fine tuning – and studies would still have to be conducted on additional grape varieties – the findings would help with future decision making around harvesting affected fruit. The study’s results are being followed up in a new project at the NWGIC, through the bilateral partnership agreement announced in July 2018. 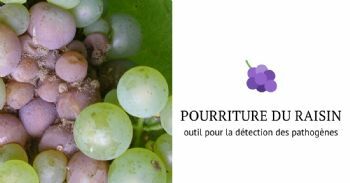 The new research will determine the thresholds for botrytis and other bunch rot contamination of grapes, and conduct a feasibility assessment of the most appropriate practices to manage faults in wine when bunch rot thresholds are exceeded. The project's final report is available here.